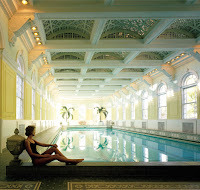 Built in 1892, the Homestead Spa is one of America’s most historic luxury spas. Still fed by the historic hot springs that have attracted travelers since the 1700s, the spa provides the ultimate in rejuvenation and relaxation. Treatments and amenities include massages, mineral baths, aromatherapies, steam and sauna, and skin, scalp and intensive facial therapies.